This certificate grants Robert B. Nay a full and unconditional pardon from prison at New Orleans in the Eastern District Louisiana. The certificate is signed by Abraham Lincoln, President of the United States, and William H. Seward, Secretary of State. Nay was convicted of defrauding the government of the United States and was sentenced to confinement and labor for a period of twenty years. 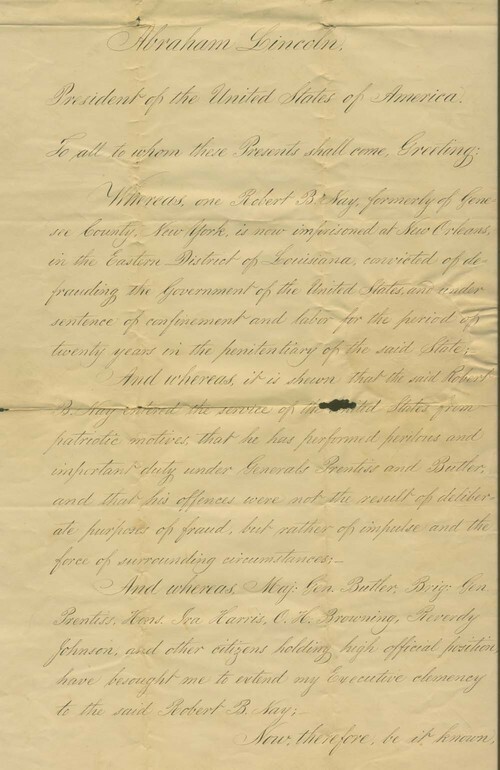 Generals Prentiss and Butler spoke on his behalf stating that Nay's offences were not the result of deliberate purposes of fraud but rather of impulse and the force of surrounding circumstances, which resulted in his pardon.